You may remember me from previous invited incursions to Mars Hill, usually on Doctor Who related themes. Foolishly, Paul has now kindly invited me to be a more regular contributor, in what I’m loosely calling Fandom Corner. It won’t all be Doctor Who related, but I thought I’d start on that theme. 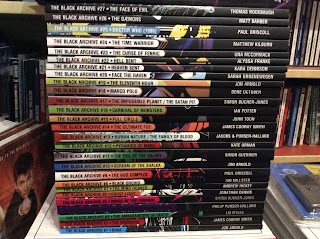 I love The Black Archive from Obverse Books. Launched in March 2016, each of its book-length volumes focus on a single Doctor Who story. For those from pre-2005, that’s a fairly straightforward business of looking at multiple episode tales (e.g. Marco Polo, The Face of Evil etc) but the recent series are more disparate in structure, even if there is an arc. Their volumes therefore focus on single episodes, or a pair/trilogy of episodes (e.g. The Eleventh Hour, Human Nature/The Family of Blood). The series kicked off with Rose, and it’s been a delight ever since. Their length (20-40,000 words) means you could choose to devour a volume in a day, and their focus on the narrative and themes, rather than the production per se, makes for enthralling reading material. Like the stories themselves, they cover history, philosophy, sci-fi and more. Doctor Who is full of ideas, and the Black Archive engages joyfully with them all. Authors are also diverse. They range from fans - and there’s a nice mix of folks from across the global fan bases - to academics, and includes those who’ve written for the world of Doctor Who (the rich variety of Doctor Who novels and the realm of Big Finish Audio mean there are many exciting potential authors to come!) I want to give a special shout out to Una McCormack’s passionate discussion of The Curse of Fenric which is a total delight. Erudite and engaging, filled with fan-love but with an intelligent critical eye, I got to the end and immediately wanted to watch Fenric again. That’s what any good book on television should do: take you back to the source material with fresh thoughts. I can’t recommend these books highly enough. See you in April fandom folk!